Well, this is a first for me. I was sent a pen from The Pen Chalet and asked to do a review. First things first. 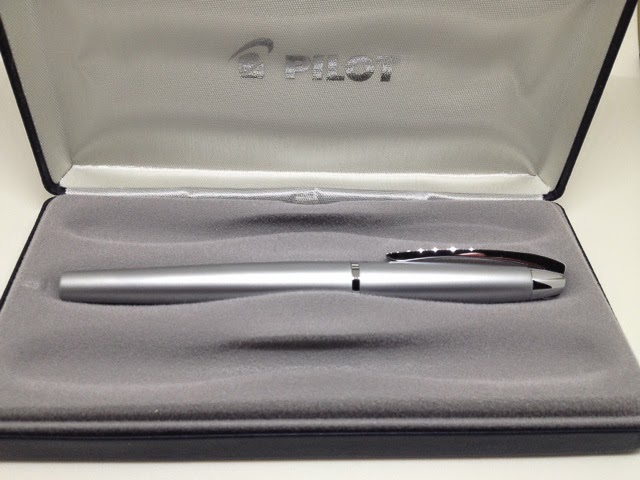 The pen was sent to me free of charge and no monies changed hands. Now the person who sent me the pen (Ron) said he has perused my little hole in the internet a few times and wondered if I would have a go at the pen. Sure.. Who doesn't like playing with some new toys. The packaging is inviting. This is a (retail) $48 pen currently priced at $24. For a $48 pen I expect a certain level of packaging care. I don't expect a "shove it in a box" $20 pen. The box is a faux leather (pleather??) spring hinge. Guessing they use this for the pen/pencil sets as well as there are 3 placement spots. On lifting the tray you will find the care instructions and a cartridge. This pen also used a "squeeze" type converter. Think inner tube with a metal bracket. Still working on the photo thing.. The nib I found interesting. This is the first Japanese pen I have ever had and was warned from other that the nibs ran finer than other makers. They were right. And in a happy way for me. I like fine -> Extra fine nibs. What was sent to me was a "medium" nib, but to me this would have been a fine in a Kaweco. My meager attempt at a writing sample. These are using the same ink. 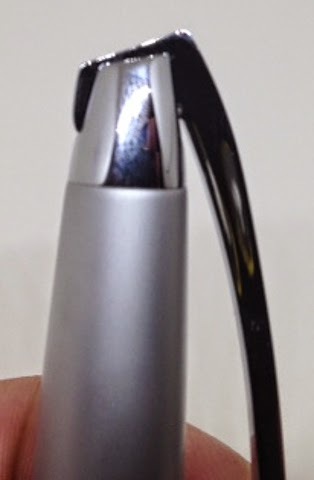 The Kaweco is using a cart and the Pilot is using the bottle version. Notice the line is almost identical. I will say this. The Pilot flows REALLY NICE. No skip, hop or jump right out of the box. The weight of the pen is pretty close to my TWSBI pens with a cap posted though I don't really write with the cap on the TWSBI. 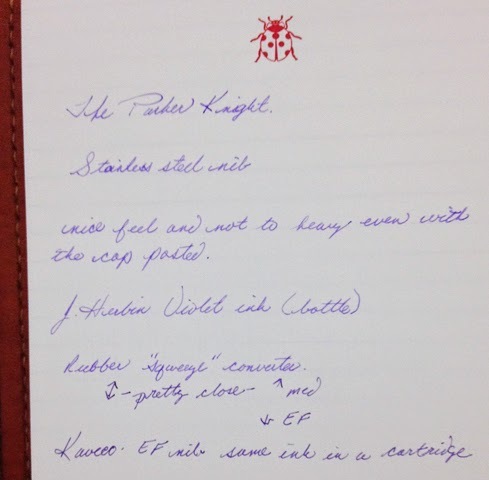 The Pilot Knight feels nice in my hand and really comfy without the cap. The pen build quality is something I would figure from Pilot. 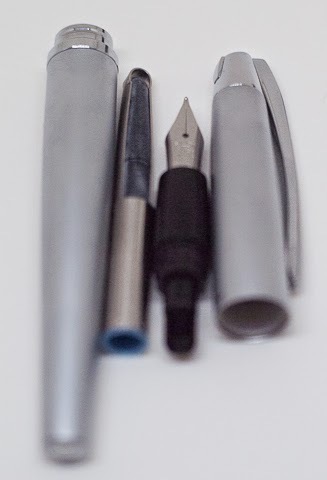 Although i have never used anything other than the ballpoints. Check out the spring on the cap. You can see the hinging and it is nice and tight. This thing is not going to fly out of your pocket. In comparison to some of my regular use pens.. I would have no problem hauling this thing around along with my Retrakt from Karas. Bottom line, would I buy this? Yup. For $24 bucks you can't go wrong. I would and will probably be ordering one from The Pen Chalet to throw in my laptop bag for an everyday carry. It's built like a tank. The cap has a great "Snap" to it. Won't worry about dent scratch and it's right in line with the Kaweco pricing with in my opinion a better nib with a converter included. 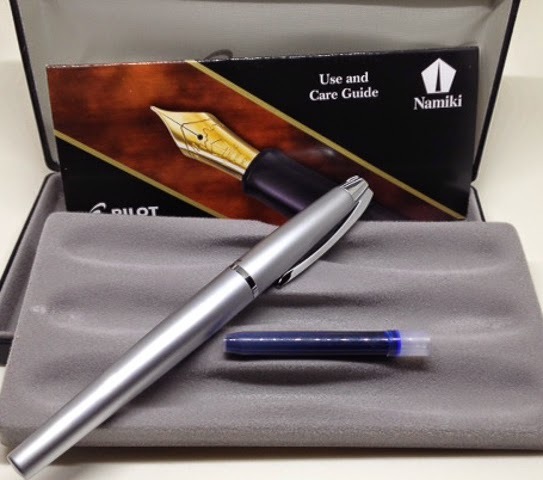 On a side note The Pen Chalet is doing an ink giveaway for some Sailor Jentle Ink. So there ya have it folks. My first pen review. I am going to be doing a review on a few notebooks that were sent to me in the next few weeks and will be giving a few away. Stay tuned.